I love making fabric flowers! There are so many ways to use them: from clothing, to hair or bag accessories, to home decor, and the list go on. 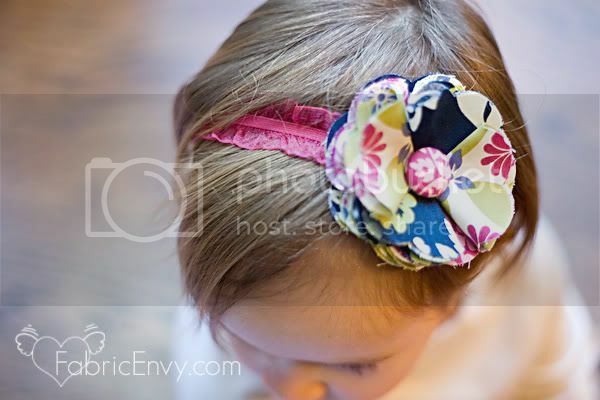 I love using this particular design to make my little girls hair flowers. I usually sew them to an alligator clip for my 2 and 6 year old. For my little six month old I’ve attached the flower to a piece of Riley Blake Ruffle Elastic in Hot Pink and then made it into a headband, and oh boy (or should a say girl) is it cute! You could easily use scraps to make these flowers, but because I had very specific color schemes in mind I used these Fat Quarter bundles: Lark by Amy Butler, Secret Garden by Sandi Henderson, and Grand Bazaar by Patty Young. Because it uses so little fabric I’ve got lots of material left over to make little wallets, a clutch, or whatever else I can dream up! This tutorial will show you how to make the flower. 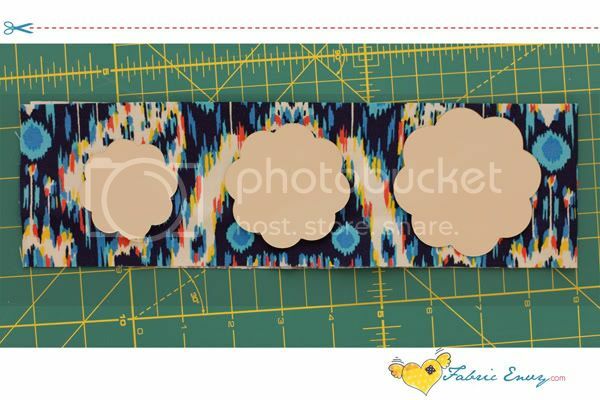 You can use the template to make three different sizes: Small-2 inch, Medium- 2 ½ inch, and Large-3 inch. Print and cut out the template (you can download the full size template here, or by clicking on the picture) for your desired flower size on heavy cardstock that can easily be used for tracing. A set of cover buttons: Size 30 (large flower), 24 (medium flower), and 20 (small flower). If you do not know how to cover a button you can check out my video tutorial for making cover button earrings here. A Fat Quarter is approximately 18”x22”. I began by folding it in half (short side to short side) and placed it on my cutting mat. Because I wanted to pin and cut out all three flower sizes at once with as little fabric waste as possible I then cut my material at 6 ½ inches and then in a half again at 3 ¼ inches. Now I have two pieces of fabric measuring 3 ¼” x 22”. I’ve kept the fabric folded in half the entire time so that what I see is a 3 ¼ x 11 inch piece that will hold all three of my flowers perfectly with very little waste. 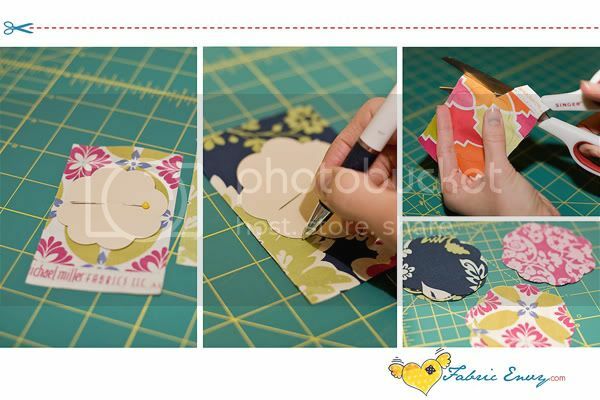 Keep your fabric folded and pin all three flower templates into place ( the picture shows all three different sizes, you can easily print out extra templates and cut them all the same size during this step). This will allow you to cut out two of each size at once. You’ll end up with a total of six petals. Be sure to save pieces of your scraps to make the cover buttons! 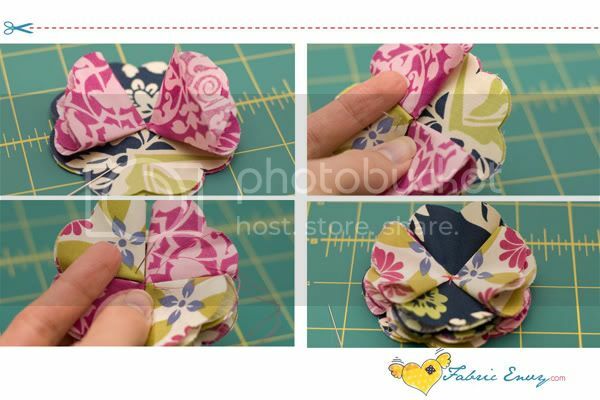 Do this with the rest of your fabric assortment until you have at least 12 petals to complete one flower. I cut out 36 flower petals because I wanted to make all three sizes at once. Just cut out 12 of the same sized template if you want to make one flower. Get out your needle, and thread it with a long piece of coordinating thread. Take a moment to decide how you want the colors to look. 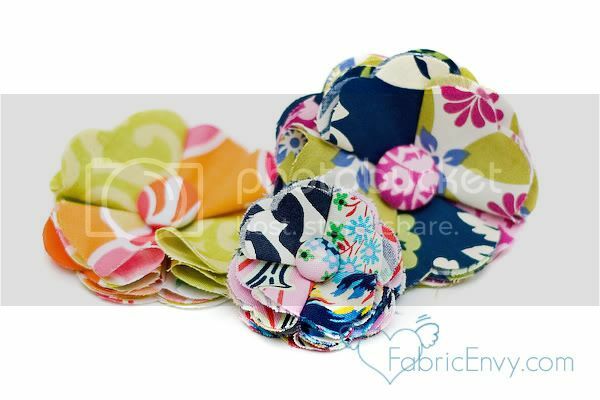 Once you’ve chosen how to blend your fabrics you’ll begin to layer the flower. Now take your needle and thread and grab one of your heart shaped petals and match it up to the petal shape underneath. Tack it down with a simple stitch. Next take another petal and place on the opposite side from the first petal and tack it down. Do this one more time for a double-layered flower. The thickness makes it super cute! 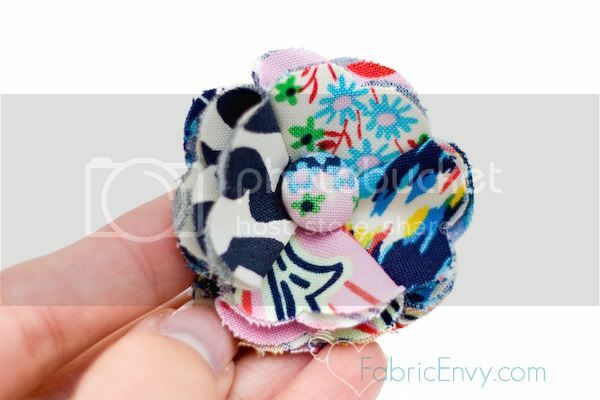 Now it’s time to add the button to your petals and make the flowers center. Sew the button on by coming up through the bottom of the flower first with your needle and thread and insert it through the shank. Continue to sew until the button is firmly in place. Phew, now you have a beautiful flower! If you cut out more petals to make the medium and small flowers, then hop to it! This time instead of tacking them down on opposite sides you’ll layer them on top of each other so that each petal is showing only half of the heart-shape. Tack down petals a few at a time and finish the 8th petal by tucking it under the first until it all matches up. Because the flower uses all 8 petals in one layer there’s no need to do a second set. Now add your cover button and you’re done! Now that you’ve got a totally gorgeous flower on hand, you need to decide what the heck you’re going to do with it. I couldn’t help myself and made yet another headband for my daughters to wear. I used Ruffled elastic by Riley Blake in Hot Pink for the band. You can pick it up in my shop, here for only $1.00 a yard! I cut my elastic at 17.5” to fit my two year old, then brought the two ends together and let it overlap by a ¼ of an inch to give me room to stitch it together. Once the band is made you can sew your flower on. To finish it off I’ve hot glued on a very small piece of felt on the underside to cover my stitching/work and make it soft on my daughter’s head. Now sit back and admire your creation you crafty chic! Thank you for this tutorial! I won some ruffled elastic in a giveaway recently and wasn't quite sure what to do with it. I love this!! So glad I could help you! 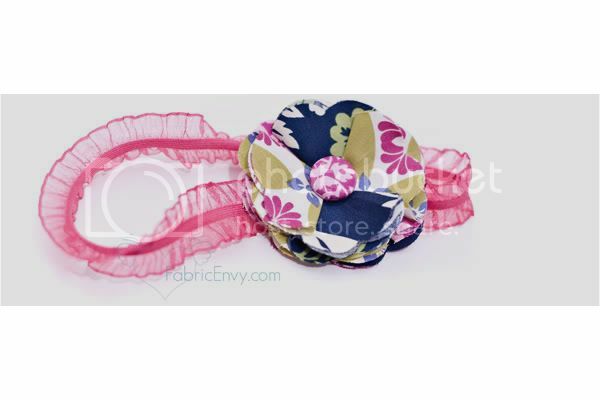 The Ruffle elastic really does make the cutest headbands ever! What an awesome tutorial! Just popping over and now following you blog from Quilt Story's giveaway! Can't wait to keep reading! Thank you so much for this great tutorial! I want to go and make a few right now (bummer I'm at work - lol). May I ask where you find your elastic? At my local craft and fabric stores, they don't have anything that cute! It's only $1.00 per yard! Good luck with your projects! Well that certainly makes it easy, thanks so much! I have two grand daughter and can"t waite to make some flower headbands. Glad to see your post and really love your coloring and the way you chose the color it is really appreciable,defiantly i ll Send Flowers Pakistan this kind of idea to my friend who is much follower of this kind of stuff. Please help!? 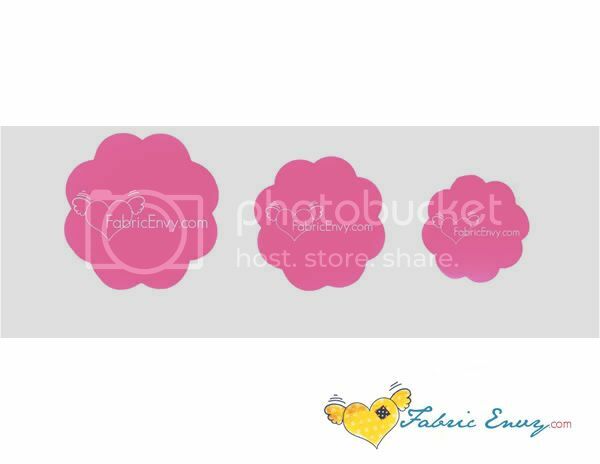 I am trying to make these flowers for a headband and I am having an issue downloading the flowers template. It keeps redirecting me to another site then keeps asking Me over and over again to log in. Can you please help me out with this? Thank you! I also would love the flower templates, but it is redirecting me as well. Is there a solution? I'm french, living in US. I just tried to download the patterns of the flowers so that I can do many flowers to embellish the last bag I sew…and the website is asking for a login… did it already happen ? Nice post... Thanks for sharing this information. i love headbands because its very comfortable for my head and it's very affordable. Hello! 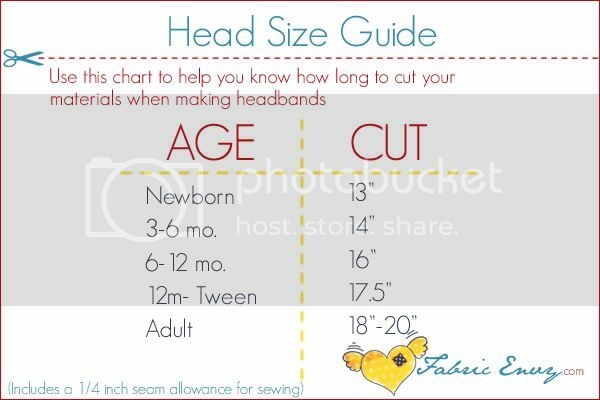 Would you mind telling me if these are the measurements you'd use to cut jersey knit headbands too? I don't know if my 18 months head is just extra giant or not because her head measures 19" and all the size charts for that age seem to be less! I'd appreciate any input you can offer. Thanks! I love this flower. It is a great size for many uses. I would like to download the template too. I hope it's a simple fix for you. Thanks for sharing your ideas! Beautiful! The ruffled elastic headband adds the cutest touch! Thank you for sharing your tutorial. These are adorable, I wish my little girl was still little!! She's 24 now…..perhaps she would still wear one! LOL! DIY Flower Headbands are really awesome and full of fun! I survived Food Poisoning! Oh Happy Monday! 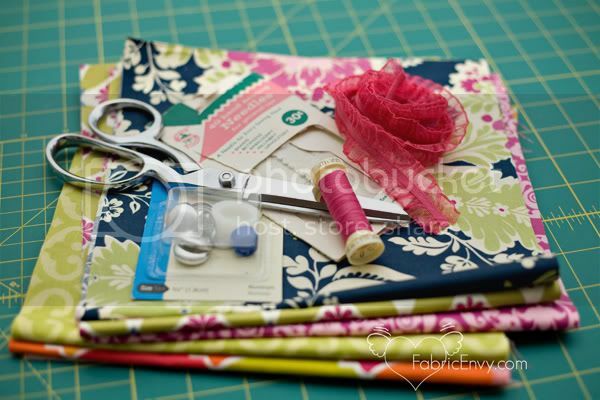 Fabric Envy Giveaway on Quilt Story! 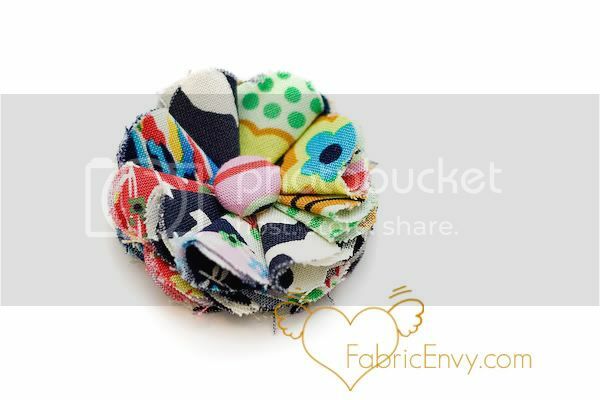 Copyright Fabric Envy All Rights Reserved. Powered by Blogger.